A new occasional column in which we visit charitable organisations in London who are looking for volunteers. This month, we visit Eltham-based HALO (Handicapped Activities and Leisure Organisation). These guys open their doors every other week to people with a range of disabilities, to provide entertainment, support, and an opportunity for people to be safe, happy and meet with friends. HALO runs regular activities, from arts and crafts to cooking and games. There are no limits or restrictions, but current members are aged 11 to 65, with mild to severe physical impairments or learning difficulties. Following recent funding cuts, HALO relies entirely on donations, charitable events and local fundraising drives; and perhaps more importantly, on volunteers, without whom they simply wouldn’t exist. The volunteers range from their early-30s to much older. There are around 20 regular volunteers who assist the guests, join in with activities, make tea, supervise, get involved, and generally help out. No special training is required — just a CRB check, a little patience, and a lot of enthusiasm. Since so many other clubs have shut down, there’s a considerable waiting list of people who’d love to attend, but sadly the lack of volunteers means that many get turned away. John started helping out after his niece, who had been a member, passed away. He knows why he returns every week. “I like the encouragement”, he says. “It’s nice to be able to relate”. Clubs like HALO showcase the humanity in an often-uncaring city, and John understands their importance, both from the perspective of a volunteer and a member. “I’m learning from them, they’re learning from us. Some members, they’ve got their world, and we’re lucky enough to be invited in. I just show up, enjoy it, and help them to enjoy themselves too. You put in what you get back”. The club is a haven of warmth and laughter. We’re there on physical activity night. A game of 'parachute' is under way. 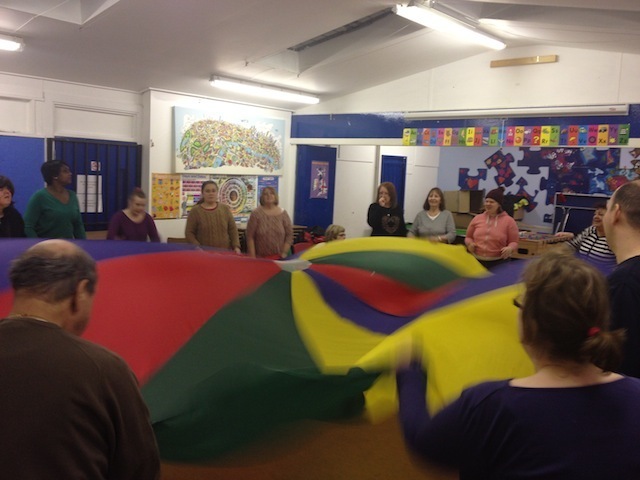 Everybody stands in a big circle around the edge of the room with a giant multicoloured parachute in the middle, which they hold by the edges and flap up and down. People then run, walk or are wheeled underneath. Cackles of laughter echo around the hall. Next up is bingo, the tables are speedily arranged by anyone who’s physically capable of lending a hand. As the numbers are read out and heads hover with intense concentration over sheets of numbers, it’s hard to identify volunteers from members — such is the encouragement towards participation, and the equality with which everyone is treated. It’s a fun evening for all involved and by the time we’re packing up to go, everyone seems visibly brightened. We leave on a high, despite the rain. As busy Londoners, it’s easy to think that we can’t fit in an activity like this, but one evening every other week is a small commitment with a huge payoff. If you live in the area, why not pop along for a night to see if it’s something you’d enjoy? HALO is held at the Middle Park Community Centre, Middle Park Avenue, Eltham, London SE9, on the first, third and (when it occurs) fifth Tuesdays of the month. It also organises day trips and one week-long holiday each year.